Dr. Jacob Mathew, Chief Editor of Malankara World, got an early Father's Day Gift this year. 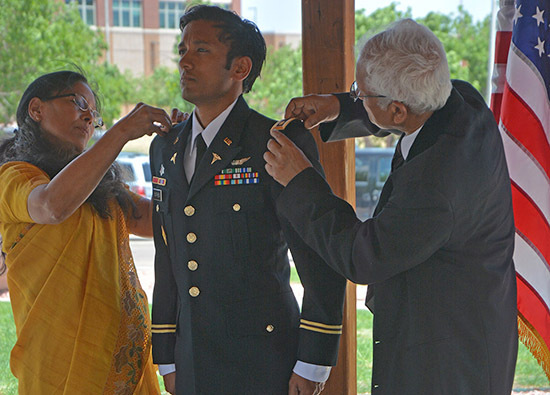 Last week, Jacob and his wife Dr. Shila Mathew, MD attended the official ceremony of promoting their son to the rank of a Major in US Army held at Colorado Springs, CO. They were invited to "pin" the new patch depicting the new rank on Major Dr. Jacob Mathew, Jr. at this occasion. Major Dr. Jacob Mathew, MD is a Battalion Flight Sergeant at the prestigious US Army Aero-Medical Group in the 4th Aviation Regiment. "The father of a righteous child has great joy; a man who fathers a wise son rejoices in him." 11. Does God Even Care About Me?